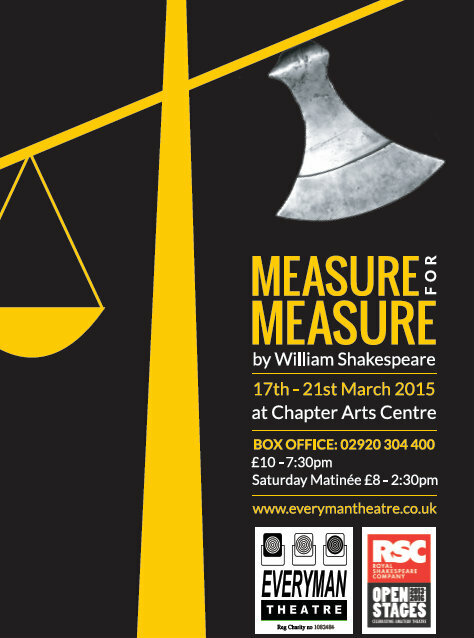 NO PROBLEM: A REVIEW OF CARDIFF’S EVERYMAN THEATRE PRODUCTION OF MEASURE FOR MEASURE – 17TH TO 21ST MARCH 2015 AT CHAPTER ARTS CENTRE. It was 7:15pm. I was in the unenviable position of attempting to find a parking space in Canton during a football match on St Patrick’s Day. The play was to start at 7:30pm and I hadn’t even picked up my tickets yet. I’d been stuck in traffic for almost an hour… But I had faith that a bit of Jacobean comedy would make this all worthwhile. The set was fairly simple, just as I like it. Wooden doors, rostrums etc. The music playing as audience members shuffled in reminded me of productions at the Globe theatre I’d seen on Sky Arts. The sort of sweet (contemporary) harmonies I imagine Robert Johnson composed for Shakespeare productions. Apart from the familiar Chapter stage, this felt like a Royal Shakespeare Company production. Indeed, Cardiff’s Everyman Theatre are staging this play as part of the RSC Open Stages Project. This initiative is great for amateur theatre. I’ve watched professional productions with actors who’ve yet to disrobe themselves of amateur habits. I’ve watched amateur productions with remarkably professional actors. Seeing an amateur company with professional training was an intriguing prospect. The play opens with the Duke Vincentio (played by Brian Smith) telling his deputy, Angelo (Andreas Constantinou), that he intends to leave Vienna. This is a fib, of course, and the fantastical duke of dark corners disguises himself as a friar so that he can, like a groundling, observe his fellow actors from below. From the off Brian Smith exuded stage presence. It is easy to forget, as an audience member, how much work goes into a production like this. The duke speaks almost a third of the lines in this play. Smith’s Vincentio can be stern, he can be pitiable, he can be hilarious. It is the mark of a very good player that he clearly feels no trepidation about involving the audience with a quick glance, a cursory aside, a metatheatrical wink. I realised instantly that Vienna, and the play itself, was in good hands. Smith could pass as an RSC professional quite easily, methinks. We progress to the streets of Vienna. I was dazzled by the range of accents, some authentic, others difficult to identify. It was rather like the Babylonian play-within-a-play in Thomas Kyd’s The Spanish Tragedy. But dislocality pervades throughout this text, to the extent that Oxford editor Gary Taylor has argued for Thomas Middleton’s hand in changing the play’s setting from Italy to Vienna. As an ‘attribution scholar’ I am uncertain about this, and may pursue the subject myself one day if I progress in the field, but the point is that verisimilitude is not paramount in Shakespeare’s Measure for Measure. There are some wonderful characters on the streets of Vienna. Pompey Bum, played by the delightful Dan Burrows, who nailed every aspect of this character tour-de-force. Elbow, portrayed by Arnold Phillips, who delighted us with his hilarious malapropisms. The slanderous Lucio, played superbly by the remarkably talented Philip Jones, who wowed me not only with his twisty moustache and dangly earring but also his comic timing. Shakespeare set the precedent for Charles Dickens in his vivacious characterisation of the lower classes. We learn that Claudio (played by Henry Nott) is to be executed for impregnating Juliet (played by Amanda Lever) out of wedlock. To modern sensibilities this may seem hard to identify with, given that the players in the theatre of today are often inbred Jeremy Kyle participants. I realised that I have acted alongside most of this ensemble, and hope to act with many of them again. I was thus fully aware of their talents, but it was somewhat different watching them, like the fantastical duke, from a dark corner. There is not a weak link in this cast, I realised. Andreas Constantinou revealed himself as reliable and industrious an actor as ever. His portrayal was remarkably sinister, but he also nailed down each and every complex trait of the antagonist. At times, I even felt sympathy for him. Shakespeare’s characterisation was often paradoxical. His villains can be heroic. The heroes villainous. Constantinou’s delivery of the famous ‘What’s this?’ monologue would be good enough for entrance into any drama school, even if it has become a frequently chosen piece for auditions. He injected refreshing viscerality and dynamism into a passage that, one could argue, has been Mistress Overdone. Indeed, the play is satiated with some of Shakespeare’s best known aphorisms and speeches. Another such speech is Claudio’s ‘Ay, but to die’ piece. Henry Nott gave perhaps his most understated performance here. He oozed prospective professionalism, and though Claudio is more often not on stage than on, Nott really stood out. (He seemed rather serious during the bows… I cannot tell if he was still in character or not, but I think he should have permitted himself a smile for this wonderful performance!). I must also mention Richard Watson as the drunken and dissolute Barnardine, my favourite character in the play. He clearly relished playing this comic part, and the audience loved him. He also coped remarkably well with the only first-night hiccup that I could perceive. His cell door came off, but he used this to his advantage and emphasised the poor security in his prison house, to comic avail! The play concludes with bed tricks and revelations. It is a happy ending (though perhaps not for Angelo and Lucio). A comic ending. And yet, there’s those pockets of darkness again. For all of Isabella’s hard work in retaining her cloistered existence, she is married to the duke without a word of complaint. In this respect, the play is not unlike Shakespeare’s earlier comedies, The Taming of the Shrew and The Two Gentlemen of Verona, in that the resolution actually poses more problems than answers. Modern day audiences might question if Shakespeare was a sexist, a racist etc. (or, bardolatrously, speak as if he were Germaine Greer and John Lennon’s love child). But we are governed by the milieu of the century we live in. This mechanical resolution was a wee bit undermined by a nun’s (literally speaking) blessing. Nevertheless, Isabella looked rather affronted as the play closed to rapturous, well deserved, applause. Some very minor quibbles. A couple of silent background actors pulled focus in the last scene, and some actors did not always suit their actions to their words. Their gesticulations sometimes came across as artificial, rather than spontaneous. In this respect they did not always hold a mirror up to their characters’ natures. However, despite the risk of coming across as hyperbolic, I thought this was a tremendous production. I understand Wales Online have given four stars. I’d agree. I would be tempted to give five. It was certainly worth braving the traffic to enjoy the two hours’ traffic of the Everyman stage. You are currently browsing the Cardiff Shakespeare blog archives for the day Wednesday, March 18th, 2015.